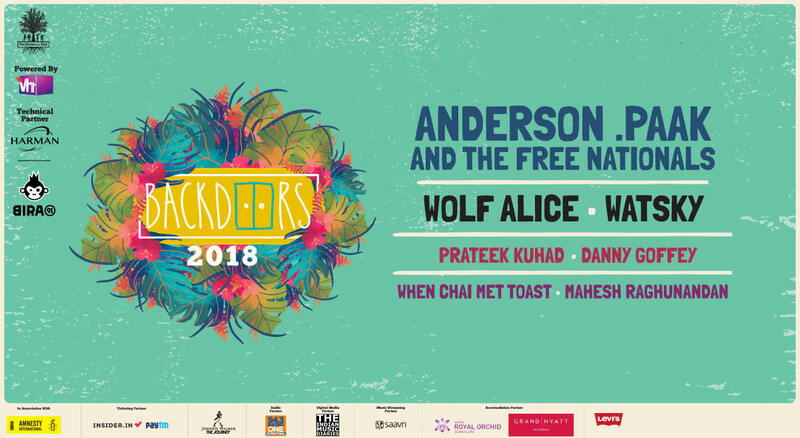 The Humming Tree's Backdoors 2018: Anderson .Paak and The Free Nationals, Wolf Alice & More! Backdoors is an extraordinary outdoor concert experience: Coming to Mumbai (Feb 14) & Bangalore (Feb 17) with two pre-shows (Jan 20-21) in Bangalore. Details below! This 2018, The Humming Tree brings two shows in Bengaluru and Mumbai featuring some of the biggest artists in the world! Backdoors is all about making space for great LIVE music that can be appreciated in the right climate. What's more, each aspect of the festival is uniquely knit together - along with a great lineup, there will be experiences loaded with fantastic energy that everyone can absorb and contribute to. This year, the festival brings to you American rap sensation Anderson .Paak & The Free Nationals, London alt-rock band Wolf Alice, and several more top international and Indian names. Limited Phase 3 tickets are now live, grab your tickets below!